By nature, human beings put their trust in institutions of authority, and should be able to rely on governing powers as the sources of truth on issues both foreign and domestic. But in an atmosphere of “fake news,” divided parties and dirty politics, this trust is waning. CHICAGO, Jan. 10, 2019 -- SpringCM, a DocuSign Company, the leading document and contract lifecycle management platform in the cloud, was named a Leader in Forrester Research's The Forrester Wave™: Contract Lifecycle Management For All Contracts, Q1 2019. Forrester Research used 30 criteria to evaluate contract lifecycle management (CLM) software providers, with 13 companies making up the entire CLM Wave™. The report provides analysis on how each provider measures up, as well as information to help CIOs evaluate criteria in choosing the right partner. Artificial intelligence and automation are creeping into the workplace of every industry, bringing the added benefits of efficiency and security. As more organizations implement AI solutions across their departments, businesses still relying on outdated, manual processes will fall behind. Legal departments ranked AI solutions last for their technology needs, according to a survey by HBR Law Department — a surprising finding considering the plethora of administrative tasks legal teams handle, like document editing, work tracking and routing. A recent report by SpringCM found legal is the primary department involved in contracts for 59% of businesses. If other departments use AI to address inefficiencies that take time away from other projects, why are legal teams ignoring the potential of artificial intelligence to transform the contracting process? SAN FRANCISCO—September 24, 2018—On the heels of closing its $220M acquisition of SpringCM just last month, DocuSign today announced the first solution to be jointly developed by both companies, DocuSign Gen.
Debuted ahead of Dreamforce—the most innovative software conference of the year taking place this week in San Francisco—DocuSign Gen allows Salesforce users to automate, simplify and streamline the generation of agreements such as sales contracts, quotes, and NDAs. Slated for general availability in spring 2019, DocuSign Gen is designed primarily for small and medium businesses and mid-market organizations. 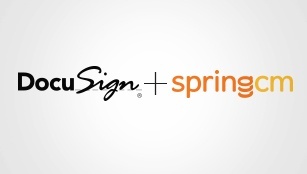 For larger enterprises, DocuSign already offers SpringCM’s Contract Management solution, which includes agreement generation among a larger set of integrated technologies. Shares of Twitter hashtag #DreamWithJames will drive donations to not-for-profit New Genes. SAN FRANCISCO, Sept. 4, 2018 /PRNewswire/ -- DocuSign, Inc. (Nasdaq: DOCU), which offers the world's #1 eSignature solution as part of its broader platform for automating the agreement process, today announced it has completed its acquisition of SpringCM, a leading cloud-based document generation and contract lifecycle management software company. 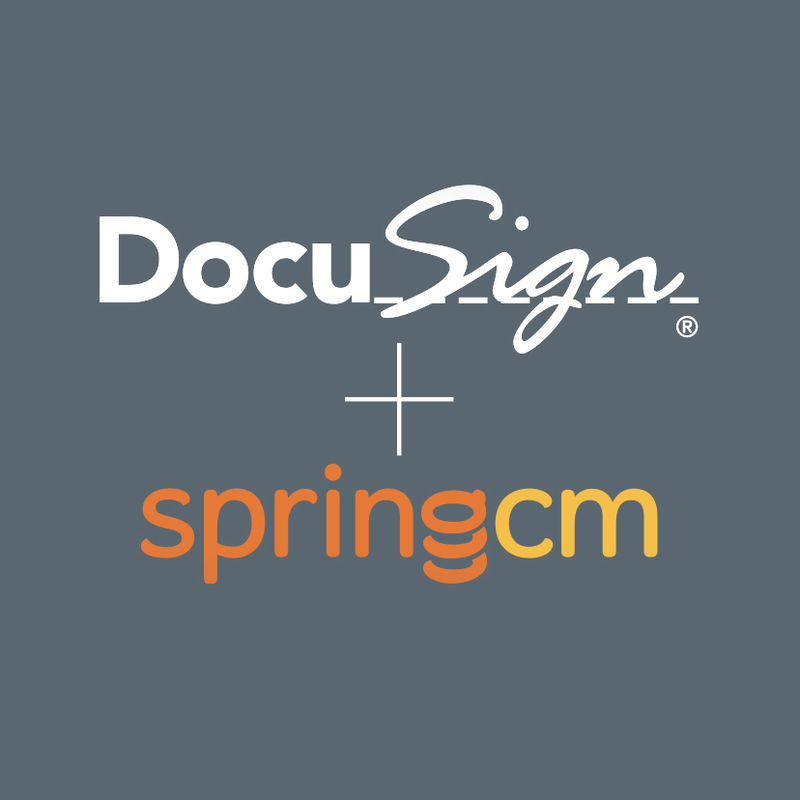 With SpringCM, DocuSign will accelerate customers' ability to modernize their Systems of Agreement—all the way from preparing to signing, acting-on, and managing agreements. 2018 State of Contract Management Report finds more than half of companies are struggling with tracking obligations, deliverables and key events. CHICAGO, Aug. 29, 2018 -- SpringCM, the leading document and contract lifecycle management platform in the cloud, released its 2018 State of Contract Management report, the company's fourth annual survey of business professionals about their companies' contract management practices. SAN FRANCISCO, CA, and CHICAGO, IL.—July 31, 2018—As part of its vision to modernize companies’ Systems of Agreement (SofA), DocuSign Inc. (Nasdaq:DOCU) today announced that it has signed a definitive agreement to acquire SpringCM, a leading cloud-based document generation and contract lifecycle management software company based in Chicago. 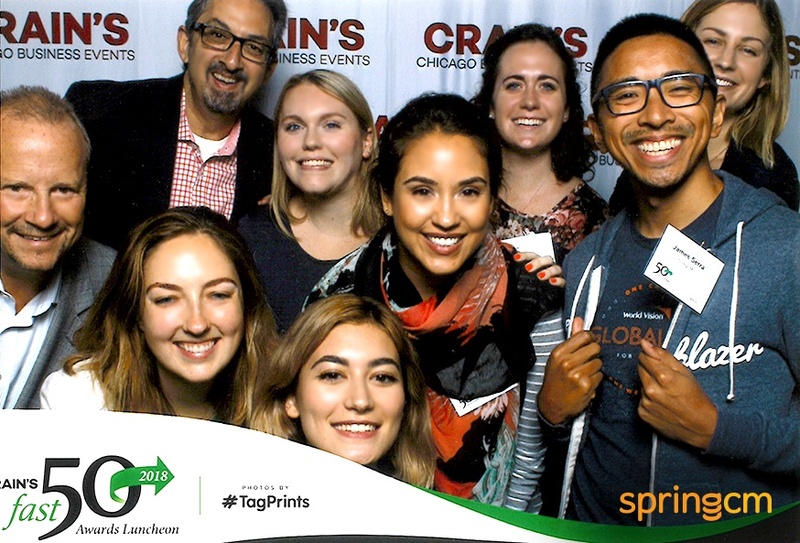 SpringCM, the leading document and contract lifecycle management platform in the cloud, announces its second consecutive year on the Crain’s Chicago Fast 50 List after a year of exponential growth. CHICAGO, June 7, 2018 — SpringCM, the leading document and contract lifecycle management platform in the cloud, accelerated growth throughout 2017 and increased the pace in Q1 of 2018. The company increased subscription bookings by more than 40 percent year-over-year during 2017, and new subscription bookings grew 69 percent in the first quarter of 2018 compared to the same period last year. This continues the trend of accelerated bookings growth of at least 40 percent in each of the past three years. SpringCM will digitize contract management processes for Shell’s global commercial business unit. CHICAGO, June 7, 2018 — SpringCM, the leading document and contract lifecycle management platform in the cloud, has been selected by one of the largest integrated energy companies in the world, to streamline its contract management processes for its global commercial business unit. SpringCM has the ability to architect a scalable, secure solution and has sound understanding of the internal challenges faced in the current contracting process. Shell has sought a solution that will integrate with Salesforce, delivering capabilities beyond contract management, enabling document-centric use cases across the enterprise. SpringCM, the leading document and contract lifecycle management platform in the cloud, was named a silver winner at this year’s Golden Trumpet Awards by Publicity Club of Chicago in the “Viral Campaigns” category. 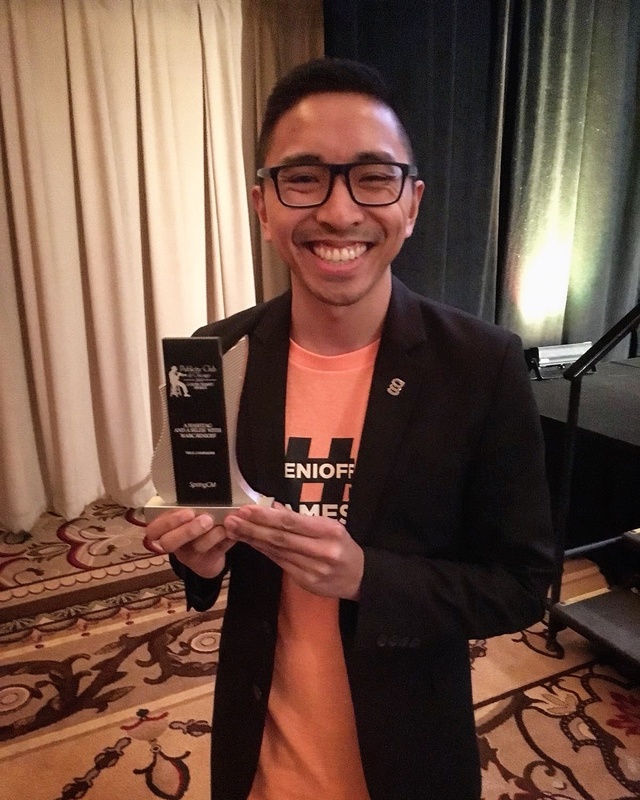 SpringCM took home the award for its #BenioffMeetJames campaign that launched in late 2017. 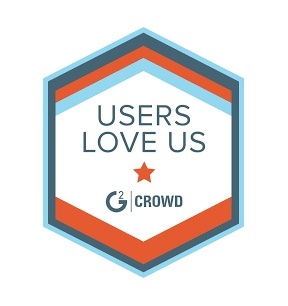 SpringCM has been identified as one of the best tech companies in Chicago based on its high levels of customer satisfaction and likeliness to recommend ratings from real G2 Crowd users. 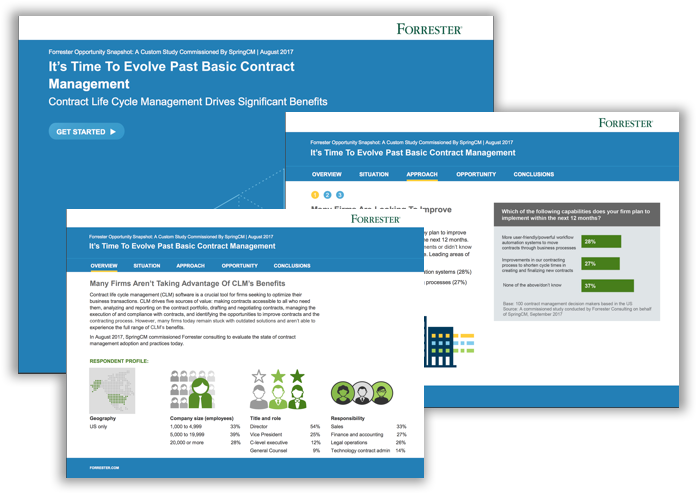 CHICAGO, Jan. 16 2018— SpringCM, the leading document and contract lifecycle management platform in the cloud, released “It’s Time to Evolve Past Basic Contract Management,” a commissioned study conducted by Forrester Consulting on behalf of SpringCM that examines the evolution of contract management within organizations. The study revealed that most businesses are not taking advantage of their platform’s full value, with nearly half having established their contract management system as nothing more than a repository of contracts. However, more than 60 percent of organizations say they plan to improve their contract management capabilities within the next 12 months. Blockchain offers what is essentially a permanent record of transactions, which creates an easy-to-follow paper trail for audits, both internal and governmental. It guarantees accuracies and solves the problem of pulling in records from a number of disparate sources. "The more you store in blockchain, the more history you have in your hands to audit," said Antonis Papatsaras, chief technology officer of SpringCM. CHICAGO, Dec. 12, 2017 /PRNewswire/ -- SpringCM, the leading document and contract lifecycle management platform in the cloud, has announced their donation of $10,000 to UCSF Benioff Children's Hospital San Francisco. SAN FRANCISCO, November 1, 2017 – SpringCM, a leading document and contract lifecycle management platform in the cloud, today announced Uber and ADP have selected SpringCM for document management and workflow automation. In addition, these companies will be speaking in sessions at Dreamforce 2017 about their experiences using SpringCM to drive digital transformation within their organizations. CHICAGO, October 25, 2017— SpringCM, the leading document and contract lifecycle management platform in the cloud, has been ranked by Built In Chicago as number 90 in the list of Top 100 Digital Companies in Chicago, rising from 95th place last year. In the last year, SpringCM grew in revenue and employee count, including hiring a new CEO, Dan Dal Degan, as well as more than 20 new employees. Additionally, the company raised $25 million in funding. Almost half of all organisations involved in contract generation find that workflow is the most challenging area of contract management. Backup and Sync was unveiled a few months ago — in fact it was unveiled twice — and while Google mentioned at the time plans to release Drive File Stream for businesses, it didn't offer many details beyond that. In the age of content marketing, PPC campaigns and mobile apps, antiquated tools like pen and paper have no place in today’s dynamic marketing landscape. However, time and time again, marketers return to outdated tools for their vital processes, leaving campaigns vulnerable to error and miscommunication. 4C, Europe’s largest independent Salesforce partner, and SpringCM, the leading document and contract management company, today announced the launch of their official delivery partnership for the EMEA region. 4C have been appointed as the first SpringCM delivery partner in the EMEA region, expanding the reach of SpringCM’s document and contract management platform to businesses across Europe and the Middle East. CHICAGO, August 29, 2017 - SpringCM, the leading cloud-based Document Management and Contract Management platform, today announced it has achieved Federal Risk and Authorization Management Program (FedRAMP) Authorization, making it a FedRAMP compliant Contract Lifecycle Management (CLM) solution. See the FedRAMP website listing here. What is a Contract Management System? How Popular Are They? 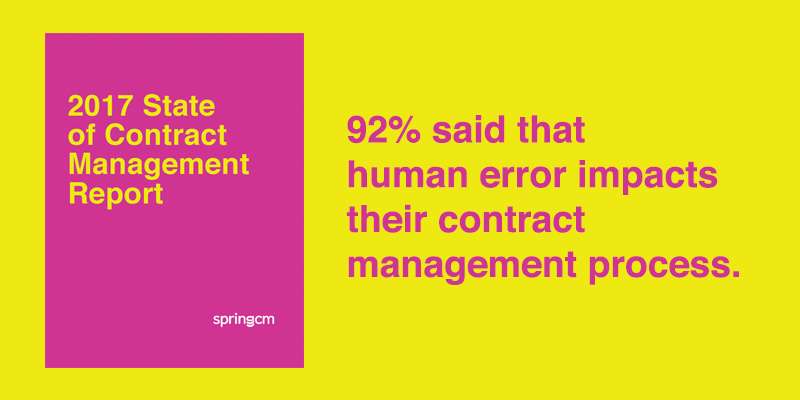 In SpringCM’s third annual State of Contract Management, they report that only 32% of survey respondents are using a contract management solution, up 6% over last year.  Contract Management Systems provide an organization with the means to securely write or upload contracts, distribute the contracts, monitor activity, manage edits, automate the approval process, and aggregate contract statistics for reporting. "Technology is all about invention and reinvention, and Crain's Tech 50 is no exception. The seventh annual list includes plenty of new faces," including SpringCM's own, Dan Dal Degan. "Browse our latest roster of founders, CEOs, coders, hackers, investors, brilliant minds and bravehearts at the forefront of Chicago's technology scene." CHICAGO, July 12, 2017 - SpringCM, the leading document and contract management platform in the cloud, announces product enhancements that deliver easier, simpler and faster ways to manage contracts, documents and other content. Enhanced workflow capabilities to the SpringCM platform, desktop and mobile apps help businesses accelerate the move toward digital transformation. CHICAGO, June 20, 2017 - SpringCM, the leading document and contract lifecycle management platform in the cloud, today announced that SThree, a global staffing organization providing specialist services in the STEM industries (science, technology, engineering and mathematics), selected SpringCM for contract lifecycle management (CLM). As a business that is reliant on efficient flow and processing of contracts, SThree will now have more visibility from the beginning to end of its contract processes. CHICAGO – April 4, 2017 – SpringCM, a leading workflow and document management platform in the cloud, today announced it now integrates with the Salesforce Government Cloud, empowering government agencies to connect with their customers, partners and employees in entirely new ways. CHICAGO, March 14, 2017 - SpringCM, a leading document and contract management solution provider for Salesforce customers, today announced the appointment of Will Wiegler as senior vice president (SVP) and chief marketing officer (CMO). Wiegler, with more than 20 years of experience growing market share for emerging tech companies, is a transformative and dynamic business leader in the cloud software space. The marketing veteran will lead SpringCM’s efforts to grow its brand awareness and increase its global reach and solution footprint in the Salesforce ecosystem. SpringCM, a fast-growing cloud software company, raised another $25 million for expansion and named a new CEO. In today's fast-moving economy, as companies split, merge, change and develop, it's increasingly necessary to have a tool that can track, manage and coordinate tasks across an entire organization; provide visibility into the business; and forster collaboration and innovation. The workplace has come a long way in the past 15 years. New technologies like smartphones, cloud computing and automation have changed the way we live and do business. Business and IT processes are evolving, enabled by technologies like workflow automation and document management software – letting employees work smarter and creating a better customer experience. Digital transformation means the use of technologies that empower all employees – not just IT leaders and CIOs – to improve business performance, transparency, efficiency, speed and agility by bringing together previously siloed departments. 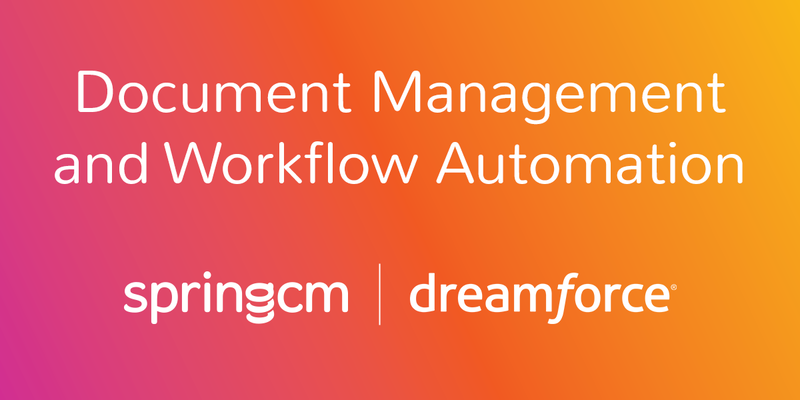 SpringCM, a document and sales contract management solution provider, has announced a cloud document management solution for Salesforce customers designed to manage files across teams and organizations. SpringCM is putting its recent $17.5 million raise to use with the introduction of G|1 Docs, an all-in-one solution to power enterprise document management for Salesforce users. By integrating document creation, management and workflows into a searchable repository, users can more easily integrate sales data into communications and content creation.  ANNAPOLIS, MD (PRWEB) - SpringCM, a leading document and sales contract management solution for Salesforce customers, today named Buan Consulting as its first Gold Certified SpringCM Partner for Systems Integrators. Buan Consulting, also the first SteelBrick (renamed to Salesforce CPQ) Certified Implementation Partner and a Salesforce Silver Cloud Alliance Partner, also announced the kick-off of its SpringCM QuickStart service offering to provide small or medium-sized businesses (SMBs) with a base contract management system. CHICAGO – Sept. 29­­, 2016 – SpringCM, a leading document and sales contract management solution for Salesforce customers, today announced G|1 Docs – the one cloud document management solution Salesforce customers need to generate, edit, share, approve and track files across teams and organizations. G|1 Docs complements Salesforce’s strengths as the standard for customer data, providing an enterprise-class solution to store, share, and work with any type of business document within the Salesforce environment. Do millennials make up a substantial portion of your IT staff? If not, they will soon. Within a few years, millennials — roughly defined as people born after 1981 — will comprise the biggest demographic in the country, overtaking the baby boomers, who are today's most populous generation. By 2020, one-third of U.S. adults will be millennials, according to researchers at the University of Southern California. G2 Crowd helps you select the best Enterprise Content Management (ECM) Software product for your business. The G2 Grid rates products based on the Enterprise Content Management (ECM) products customer satisfaction and market presence. You can select any of the products for a more detailed Enterprise Content Management (ECM) comparison. Only products with 10 or more reviews are shown in the Enterprise Content Management (ECM) Software Grid. Joel Newton is a Senior DevOps System Engineer at SpringCM, a current DevCentral MVP and DevCentral’s Featured Member for August! Illinois just had its best second-quarter haul of venture capital in years thanks to a single deal, according to one national scorecard. Chicago cloud-based document management software company SpringCM announced that it has hired Salesforce veteran Dan Dal Degan to its Board of Directors. Dal Degan was one of Salesforce's first 100 employees and started the company's central region. He's also held positions at Oracle, Siebel Systems, Sybase, Ensighten, and Synchrony. On Monday morning, sales contract management solution provider SpringCM announced that it has raised $17.5 million to accelerate its product development. Software maker SpringCM has raised another $17.5 million. Whether it’s getting employees behind new rules, new tools or just having them follow the current rule, compliance is an ongoing issue for most companies. SpringCM, the number 1 global sales contract management solution for Salesforce customers, today announced the opening of a new office in London to meet the demands of the rapidly growing business in Europe, the Middle East and Africa (EMEA). Where's the money? Obviously, not in your bank account — at least according to recent research from SpringCM, which found it typically takes companies more than a month to sign-off on some contracts. Most companies take more than a month to go from the initial “handshake” with a customer to a signed contract because they rely on manual tools, according to a survey conducted by SpringCM, a contract management solution for Salesforce customers. The second annual State of Contract Management report is the result of a survey of more than 800 professionals on their contract management processes and challenges. CHICAGO, IL — Few things are as important to growing revenue as getting the contract signed. Unfortunately, most companies take more than a month to go from the initial “handshake” with a customer to a signed contract because they rely on manual tools. 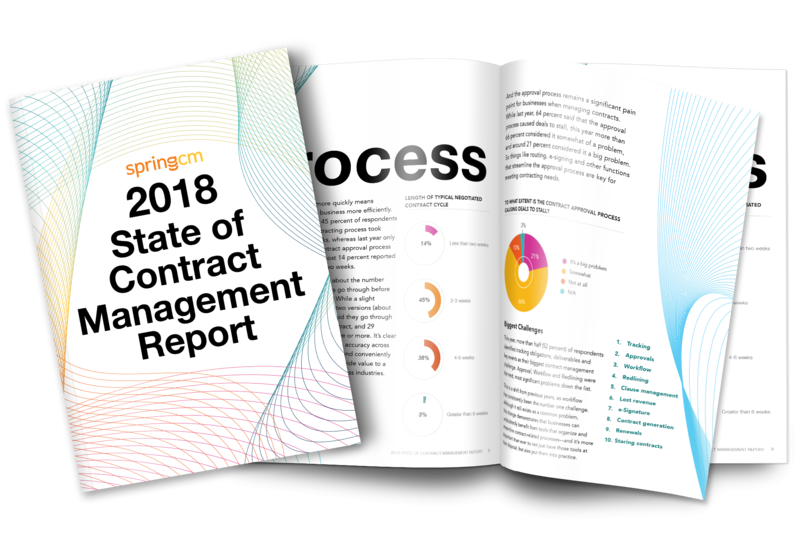 SpringCM, the premier contract management solution for Salesforce customers, announced these findings – and more – in its second annual State of Contract Management report, a survey of more than 800 professionals on their contract management processes and challenges. Manual handling of contracts is both error prone and time consuming, and yet most organizations have not yet automated these key business processes. Electronics OEMs should put automated contract lifecycle management (CLM) at the top of their to-do list, though, to achieve high visibility, decrease risk, and streamline complex processes. Electronics companies are beginning to see advantages to implementing a contract management system, which can help streamline the buying and selling process, and create full visibility from supply chain and procurement to legal, human resources, and information technology. SpringCM, the No. 1 global sales contract managementsolution for Salesforce customers, today announced a new office in San Francisco’s Financial District to meet the demands of the rapidly growing business. In today's fast-moving economy, as companies split, merge, change and develop, it's increasingly necessary to have a tool that can track, manage and coordinate tasks across an entire organization; provide visibility into the business; and foster collaboration and innovation. SpringCM, the cutting-edge document and contract management solution that allows Salesforce customers to control important business document workflows in a secure cloud environment, announced that it has been named a Platinum Cloud Alliance partner by Salesforce. SpringCM’s innovative application helps enterprises simplify the management of contract lifecycles. SpringCM, provider of a global document and contract management solution for Salesforce customers, has announced Track It for Deal Visibility. The app provides sales and legal teams, contract managers, and executives insight into the status of any sales document – SOWs, MSAs, contracts and others – via mobile and desktop devices, including Salesforce1, according to a release from the company. SpringCM, which provides document and content management software for Salesforce users, just released Track It for Deal Visibility, a mobile app which enables users to track and understand the status of sales documents. SpringCM, the top provider of contract and document management offerings for Salesforce customers, has released Track It™ for Deal Visibility, a new app that enables executives, legal and sales teams, and contract managers to gain a deeper understanding of the state of various sales documents. The app supports the Salesforce1 platform along with desktops and mobile devices. Track It follows each document and gives users visibility to avoid contract bottlenecks and to help accurately forecast when deals will close. Data on how long each step has taken in the workflow can then be rolled up into deeper analytics. CHICAGO, IL — SpringCM, the No. 1 global document and contract management solution for Salesforce customers, today announced Track It™ for Deal Visibility. The app provides sales and legal teams, contract managers, and executives insight into the status of any sales document – SOWs, MSAs, contracts and others – via mobile and desktop devices, including Salesforce1. The enterprise content management (ECM) market looks set to change again. According to new research form Boston-based Nucleus Research, enterprises are taking to the idea of storing content on external servers. New tool generates and launches contracts into review using configured templates and smart workflows. CHICAGO, IL — SpringCM, the five-star rated document and contract management solution for Salesforce.com, today released an update to its clause library feature that further enhances management of contract templates and commonly used legal language. CHICAGO, IL and PALO ALTO, CA — SteelBrick, the fastest-growing provider of Configure Price Quote (CPQ) applications built on the Salesforce Platform, and SpringCM, the five-star rated document and contract management solution for Salesforce, announced a new software application, enabling customers to manage sales quotes, proposals and contracts generated with SteelBrick CPQ (Configuration Price Quote) software. CHICAGO, IL — SpringCM, an award-winning document management platform and the leading contract management software provider for salesforce.com customers, today announced plans to serve as a sponsor of PROS Outperform 2015, the premier event for pricing, sales and revenue management leaders. The North America conference is scheduled for March 11-13 at the Hilton Americas Houston, the four-diamond luxury convention hotel located in the country’s fourth-largest city. SpringCM is the newest member of the PROS alliances and partners network. CHICAGO, IL — PROS® (NYSE: PRO), a big data software company, today announced a partnership with SpringCM to integrate the SpringCM contract management software with the PROS Cameleon CPQ (Configure-Price-Quote) solutions. The combination will be designed to provide customers with the only end-to-end opportunity-to-revenue platform – with CPQ, price optimization and contract management – for their CRM environments, such as salesforce.com and Microsoft Dynamics. Once upon a time, the media was abuzz with the great potential of mobile enterprise apps. They would make companies faster, more efficient, and address the needs of the increasingly mobile workforce. And yet, fast forward to just the summer of 2014. Vision Mobile found that of the 10,000 developers in 130 countries surveyed only 16 percent were developing for enterprises. This is the reality despite the fact that the enterprise market was by far the most financially lucrative space. Mayor Rahm Emanuel and Built In Chicago today announced the 2014 list of the Top 100 Digital Technology Companies in Chicago. According to Built In Chicago, more than 49,000 people are employed in the City’s technology economy, a 23 percent increase over 2013 and up nearly fifty percent from 2012, and there are now more than 2,100 digital technology companies in Chicago. Bridging data and capabilities across channels and departments has become critical as organizations strive to eliminate customer data silos and become more agile in responding to rapidly changing market dynamics. For many companies, cloud-based solutions like software-as-a-service (SaaS) and platform-as-a-service (PaaS) meet these needs by allowing for collaboration and connecting internal and external value chains at minimal capital expenses. Cloud content management company SpringC closed a $6 million financing this week, not long after it raised $18 million in April. In total, SpringCM has raised $45 million since 2010. DUBLIN — Research and Markets has announced the addition of the "Global SaaS-based ECM Market 2014-2018" report to their offering. Greg Buchholz, founder and CEO of content-management company SpringCM, discusses technology, innovation, "Tequila Thursday" and the airplane scenario that pops into his head when he talks with job candidates. Greg Buchholz, founder and CEO of nine-year-old SpringCM, has a big goal in mind for his cloud content management company: that it will be the first billion-dollar enterprise software company to come out of Chicago. Two tech companies with strong Chicago ties teamed up last week to provide an integrated application that accelerates sales cycles. The partnership between Chicago-based cloud content management company SpringCM and Palo Alto-based Configure Price Quote provider SteelBrick (whose CEO Godard Abel and CMO Will Wiegler are based in Chicago), will allow Salesforce.com customers to streamline all the steps that happen before a quote is generated and a contract is signed. CHICAGO, IL — SpringCM®, the leader in Content Cloud Services, and SteelBrick, provider of easy-to-use Configure Price Quote (CPQ) apps for high-growth salesforce.com customers, today announced the delivery of an integrated application that dramatically accelerates sales cycles. By combining CPQ with document and contract management capabilities, the integrated offering tackles a broad range of sales-related activities that begin when an opportunity is opened and continues after it closes. As a result, salesforce.com customers can accelerate the CPQ and contracts lifecycle and streamline the steps that happen before the quote is generated and after the contract is signed. “We don’t have presence of Silicon Valley companies, but we want to change that. We are going to primarily use the proceeds [of this funding round] to amp up sales and marketing,” Bucholtz said. The “content cloud services” company based in Chicago, IL., today announced $18 million in new financing that it will use primary to rev up its sales and marketing engine. SpringCM is cashing in on the rush to get a piece of the cloud, raising $18 million in venture funding. The Loop-based software maker founded in 2005 has raised $50 million. The latest infusion comes from Foundation Capital of Menlo Park, Calif., Boston-based North Bridge Capital LLC and Goff Capital Partners of Fort Worth, Texas. On April 2, 2014 SpringCM announced the release of two applications that further integrate the company’s enterprise content management (ECM) solution into Salesforce applications to give users direct access to enterprise content in the user interface (UI). Embedding content access into the UI reduces window switching among users, accelerating productivity among sales teams and increasing the ROI for cloud ECM and CRM deployments.  SpringCM, the cloud-based content management system announced a new product this week for Salesforce.com users that provides a way to embed SpringCM technology inside SFDC pages. SpringCM has unveiled the File it! and Get it! apps for SpringCM for Salesforce. SpringCM for Salesforce embeds a secure content cloud in Salesforce that makes it easier to store, share and work with content—all without leaving Salesforce. CHICAGO, IL — SpringCM®, the leader in Content Cloud Services, today announced the delivery of the SpringCM File it! and Get it! apps for SpringCM for Salesforce, which embeds a secure content cloud in Salesforce. SpringCM’s award-winning application makes it easier to store, share and work with content—all without leaving Salesforce. SpringCM is proud to be named as one of KMWorld's 100 Companies that Matters in Knowledge Management in 2014! InformationWeek ran a thought leadership article authored by SpringCM's founder and Cheif Customer Officer, Jeff Piper. CHICAGO, IL — SpringCM, the leader in Content Cloud Services, today announced enhancements to the SpringCM platform that make it easier than ever for enterprises to share SpringCM content with people who do not use SpringCM. SpringCM users can now share content with customers, partners, vendors and other external stakeholders, while still taking advantage of SpringCM’s advanced security and content management features. And SpringCM Administrators can maintain security and control by determining, for individual folders and documents, what content can be shared, by whom and how. A recent Cloud services provider SpringCM unveiled a new release of its cloud platform geared toward marketers and sales teams, and with an emphasis on security and easier content sharing outside the SpringCM platform. CHICAGO, IL — SpringCM®, the leader in Content Cloud Services, today announced a significant update to the company’s Content Cloud Service. SpringCM has released new features that help Sales and Marketing teams more quickly surface and collaborate on content critical to lead generation, deal closings, contract management, sales presentations and more. CHICAGO, IL — SpringCM® today announced significant momentum from enterprises jointly adopting SpringCM’s Content Cloud Services and partner applications including Adobe® EchoSign®’s e-signature and web contracting solution to modernize contract execution. CHICAGO, IL — SpringCM®, the leader in content cloud services, today announced SpringCM Content Cloud Services integration with Salesforce Identity. Now generally available, Salesforce Identity delivers integrated identity services to any app, on any device – empowering CIOs to enable single sign-on across SpringCM Content Cloud Services, Salesforce and any other web, mobile and on-premise apps – centrally managed through the Salesforce Platform. SAN FRANCISCO, CA — SpringCM®, a Silver level member of Oracle PartnerNetwork (OPN), today announced that the company’s Content Cloud Services have been integrated with Oracle Sales Cloud (Fusion CRM). SpringCM’s Cloud Content Services together with Oracle Sales Cloud provides a single destination for storing, sharing and working with content, from concept to completion, on virtually any device. The integrated solution gives Oracle Sales Cloud users one-click access to sales-related documents, enabling them to better manage content, such as quotes and contracts, throughout the sales process. The integrated solution is now available in the new Oracle Cloud Marketplace. SAN FRANCISCO, CA — SpringCM®, a Silver level member of Oracle PartnerNetwork (OPN), today announced the availability of their Content Cloud Services solution in the new Oracle Cloud Marketplace. CHICAGO, IL — SpringCM®, the leader in Content Cloud Services, today announced that Karry Kleeman has joined SpringCM, as senior vice president of Worldwide Sales, reporting to CEO Christopher Junker. Karry, who has extensive experience building and rapidly growing cloud services and content-focused companies, will lead SpringCM’s direct global sales team. SpringCM®, the leader in Content Cloud Services, today announced significant customer wins across a range of industries. Enterprises and public agencies are turning to SpringCM to transform the way their employees, customers and partners find, share, collaborate and work with content. And these organizations are extending their use of SpringCM to close the gaps that exist between mission-critical content and key business processes including contracts, employee records, compliance documents and more. Allowing employees to “bringing your own device to work” (BYOD) has been a hotly contested corporate political football for the last few years. And like most political discussions today, BYOD is being reduced to the level of Congressional debate: polar opposites staying steadfastly stuck to their opinions, while nothing is done to address a serious problem. Impassioned arguments are bringing us nowhere closer to a resolution, and the risk of inaction is great. CHICAGO, IL — SpringCM(R), the leader in Content Cloud Services for the enterprise, announced that Facebook will be presenting its use of SpringCM for employee onboarding at the HR Shared Services and Outsourcing Summit. Vijay Rao, manager of "peeps" (aka people services) at Facebook, will be presenting with Ben Kiker, chief marketing officer at SpringCM, on "Taking the Routine out of HR - and Putting the Fun Back In." The session will be held on Tuesday, May 14, at 11:45 am at the Hotel Sax in Chicago. CHICAGO, IL — SpringCM®, the leader in Content Cloud Services for the enterprise, announced that Facebook will be presenting its use of SpringCM for employee onboarding at the HR Shared Services and Outsourcing Summit. Vijay Rao, manager of “peeps” (aka people services) at Facebook, will be presenting with Ben Kiker, chief marketing officer at SpringCM, on “Taking the Routine out of HR – and Putting the Fun Back In”. The session will be held on Tuesday, May 14 at 11:45 am at the Hotel Sax in Chicago. SpringCM makes KM World's list of the top 100 companies that matters most in knowledge management. As vendors push their products onto the cloud and out to an increasingly mobile workforce, content security has never been more important. While always important, the increase in mobile device use has made it become a key issue for enterprises. The latest company to tackle this is SpringCM. SpringCM is an old hand in the content and document management game and with the development of its cloud content capabilities, mobile security and the ability to synchronize content from any mobile device became essential. As vendors push their products onto the cloud and out to an increasingly mobile workforce, content security has never been more important. While always important, the increase in mobile device use has made it become a key issue for enterprises. The latest company to tackle this is SpringCM. CHICAGO, IL — SpringCM®, the leader in Content Cloud Services for the enterprise, announced today that it has delivered enhanced security capabilities across its cloud application and infrastructure to support rapidly growing demand for its Content Cloud Services from enterprises. These enhancements enable SpringCM customers to efficiently manage secure, synchronized access to content from any mobile device or application. They also provide enterprises greater control over critical-path content and prevent sensitive data from “walking out the door”. CHICAGO, IL — SpringCM®, the leader in Content Cloud Services for the enterprise for the enterprise, announced today that it has augmented its cloud infrastructure to support rapidly growing demand. SpringCM has expanded its delivery strategy to include SuperNAP from Switch Communications, widely regarded as the world’s largest and most powerful datacenter. SpringCM has been around longer than most cloud services, yet seems to have gotten lost in the shuffle of shinier, newer models. Not to be outdone, the company announced a new set of mobile content services this week that protect content on mobile devices on the go. Former Sybase, Groove Networks, and USinternetworking Executive to Serve as Executive Chairman. HERNDON, Va. — The U.S. Department of Energy's National Renewable Energy Laboratory (NREL), the only national laboratory exclusively dedicated to the advancement of renewable energy and energy efficiency technologies from concept to commercial application, has selected Privia, LLC to provide the organization with an Enterprise Content Management (ECM) system. HERNDON, VA — The U.S. Department of Energy’s National Renewable Energy Laboratory (NREL), the only national laboratory exclusively dedicated to the advancement of renewable energy and energy efficiency technologies from concept to commercial application, has selected Privia, LLC to provide the organization with an Enterprise Content Management (ECM) system. Salesforce.com Recognizes Top AppExchange Partner Solutions Based on User Reviews; Customers Recognize That Content Matters, Choose SpringCM for Its Enterprise-Class Functionality, User Experience and Security With All the Benefits of the Cloud. CHICAGO, IL — SpringCM today announced it has been named recipient of the Salesforce AppExchange Customer Choice Awards for Collaboration, as selected by salesforce.com customers. In receiving this award, SpringCM joined all the winners in receiving recognition for their ability to take customer success to new levels. Built using the Salesforce Platform, SpringCM is immediately available for test drive and deployment on the AppExchange, the world's leading business apps marketplace, at http://www.salesforce.com/appexchange/.